Three College of the Mainland employees - Sheena Abernathy, Matthew Busby and Sean Skipworth - were included in the inaugural list of "40 Under 40" established by the Galveston Daily News. 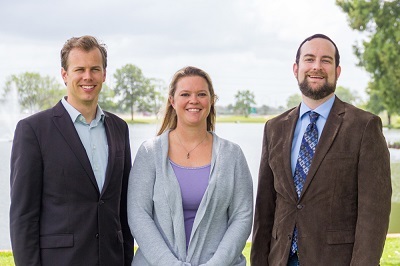 Three College of the Mainland employees were named to the inaugural Galveston Daily News "40 Under 40" list. The three “movers and shakers” include Sheena Abernathy, Matthew Busby and Sean Skipworth. Abernathy, an associate professor of biology, is co-advisor of the Science Club and works closely with the Texas Master Naturalists to grow coastal prairie plants in the college’s greenhouse. The plants are then planted at the Texas City Prairie Preserve, Armand Bayou Nature Center and others. She has been the recipient of two grants while at COM to help with her classroom experience. The first from Texas New Mexico Power was for binoculars for students to use to bird watch and conduct wildlife surveys. The second from Dow was to improve the greenhouse facility as for a partnership with Texas Master Naturalists. Abernathy attended undergraduate and graduate school at Sam Houston State University and earned a master’s degree in biology. Busby, is an advancement officer for the College of the Mainland Foundation. He began his educational journey at Temple College where he received an associate degree before earning a bachelor’s degree in political science from Baylor University. He also is a Certified Fund Raising Executive. The sixth-generation Texan claims one of his proudest accomplishments was the re-establishment of the COM Foundation and helping rebuild the trust and respect from the community and donors over the past four years. Busby works to raise money to establish new scholarships, endowments and other college initiatives. Busby currently serves as president and CEO of the Texas Association of Community College Foundations and has volunteered with United Way of Galveston County Mainland, the League City Regional Chamber of Commerce and the League City Rotary Club. Skipworth is an associate professor of government. He earned a bachelor’s degree in political science and international studies at Midwestern State University and a master’s degree in political science from the University of Houston. At COM, Skipworth not only teaches about politics in America but he strives to provide students with the skills they need to participate in government through objective debates over contemporary political issues all while teaching them the principles on which the country was founded. Skipworth also is a member of the President’s Cabinet as president of the Faculty Senate president, chaired the college’s Curriculum Committee, is a Student Government Association advisor, served on the Presidential Search Committee and founded COMPeers, which is a volunteer group made up of COM employees. Earlier this year Skipworth and his wife, Melissa, who is a COM Board of Trustees member, established the Skip and Melissa Skipworth IMPACT Scholarship. In their application for being named to the 40 Under 40 list, the three were asked “As a child what did you want to be when you grew up?” None listed working at College of the Mainland! Abernathy: Honestly, I don’t remember thinking about growing up as a child. I was having too much fun being a kid and going fishing with my Grandpa or helping him in his wood working shop. Busby: I couldn’t decide between being a constitutional law attorney, missionary or musician. Skipworth: The president, a lawyer and, according to my mother, He-Man.